Textbook Mommy: Blogorama Bonanza Event Sign-Ups! 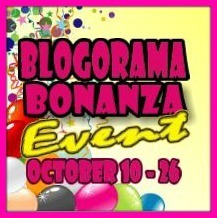 It's time to sign up for the Blogorama Bonanza Event! This event is being hosted by Jayla's Three of Us and is set to be a huge event with 100 blogs participating. To join up you need to offer a giveaway prize of at least a $25 value that you can choose to work with a sponsor or sponsor yourself. This event starts on October 10, 2012 at 12:01 AM EST and ends on October 26, 2012 at 11:59 AM EST. To learn more and join up for this fun event, click here!